​Rogue is starting a new life in a new home in Trenton. He will get lots of attention, which he deserves from this loving family. 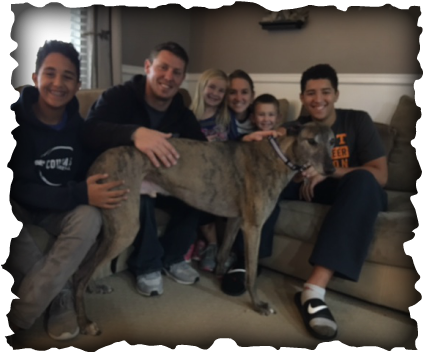 Hayze, Josh, Evie, Jessica, Jett and Isaiah met Rogue and fell in love, they were all so excited to have him HOME. He now has a HUGE yard and will enjoy stretching his legs running and playing! Plenty of room to add another greyhound! :) He is a lucky boy!